Like anywhere else in the world, the weather in China can be difficult to predict. 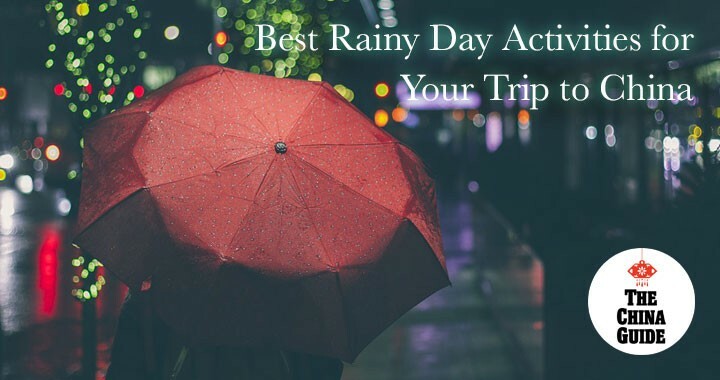 And while visiting at certain times of the year can help lower your chances of bad weather, it’s possible you’ll encounter some inclement conditions, whether it’s rain, sleet, smog, or extreme heat, during your trip. Beijing is the country’s epicenter and is thus the perfect place to see various facets of Chinese culture on display. One of the best ways to enjoy some cultural immersion without needing to go outdoors is via an evening show, and Beijing has a host of different options for spectators of all ages and interests. A traditional nighttime diversion is Beijing’s eponymous Peking opera, which dates back hundreds of years and makes for a culturally revelatory event. This stylized form of performance art combines music, singing, dance, and acrobatics, all completed in elaborate costumes and makeup. We recommend catching a show at the Huguang Guild Hall, where Peking opera performances have been held for over two hundred years. If you’re visiting Beijing with children, a family-friendly and entertaining option is the world-famous “Legend of Kung-fu” show. This impressive show, which features some of China’s most experienced martial artists, follows the story of a young monk who dreams of becoming a kung-fu master. The performance is easy to follow and fun for kids. Another of our favorite evening events in Beijing is the Chaoyang Acrobatic Show. This fantastic and exciting spectacle welds world-class acrobatic acts together with traditional Chinese stories and imagery to form a truly one-of-a-kind performance that is perfect for a rainy night in. China has a history that stretches back thousands of years, as well as a rich and vibrant culture, and thus offers a veritable smorgasbord of museums, whatever your interests. If nasty weather strikes during your trip, a perfect indoor activity is to explore one of these world-famous museums, many of which can be found in the huge metropolis of Shanghai. Your first stop among the city's many museums should be the appropriately named Shanghai Museum, which boasts one of the world’s largest collections of ancient Chinese art. Totaling over 120,000 pieces, including bronzes, ceramics, paintings, sculptures, jade, and more, the sheer size of its collection is stunning, making this museum a must for art and history buffs. Architecture aficionados will delight in Shanghai’s Urban Planning Exhibition Hall, which narrates the city’s development, from its start as a small fishing village to its current status as one of the world’s largest cities. Chief among the center’s exhibits is its impressive scale model of the city of Shanghai, including all existing and approved buildings, which spreads across the third floor of the building. One of our favorite hidden gems in Shanghai is the Shikumen Open House Museum, tucked away in the winding alleys of the Former French Concession. This museum is located in a perfectly restored Shikumen house, an architectural style typical of 19th and 20th century Shanghai, complete with period furniture and dressings. Walking through this authentically restored residence will fully immerse you in the city’s colorful past while protecting you from the elements. If your travels take you to the southern province of Guangxi, an area known for its physical (i.e., outdoor) beauty, a string of rainy days might seem especially disappointing. Luckily, beneath Guilin and Yangshuo’s scenic karst peaks lies one of their most magical secrets: a vast network of caves, many of which are open to visitors. Guilin’s Reed Flute Cave is one of the city’s most famous attractions, and for good reason. This underground natural palace was first discovered over a thousand years ago and has wowed visitors with its cavernous halls and intricate rock formations ever since. Reed Flute Cave features a large collection of stalagmites and stalactites, as well as numerous ink inscriptions on its walls that date back as far as the 790s. Those seeking to escape inclement weather in Yangshuo should head to Silver Cave, the largest karst cave in the wider Guilin area. Like Reed Flute Cave, Silver Cave houses numerous exquisite rock and crystal formations, including a series of cascading stalactites that resemble a waterfall. These natural wonders have not escaped modern influence, however: today, their stunning rock formations are illuminated with multicolor lights, which some might find enhances the beauty of the caves’ features. Tea is far and away the most popular beverage in China, and in no city is this more true than Chengdu. In fact, this Sichuan capital (and so-called panda capital of the world) is rumored to hold more than 10,000 teahouses, so you will have no trouble finding one to retreat to in case of rain. The most popular tea-sipping spot in Chengdu is the Heming teahouse in People’s Park. While there’s nowhere more quintessential than this central park for enjoying local tea, it’s only partially covered, with many tables open to the elements. In case of poor weather, we suggest instead heading to the city’s historic, Qing-era alleyways, called Kuanzhai Xiangzi, which are lined with countless teahouses, many of which also hold regular Sichuan opera performances. Our favorite teahouse in this area is the 200-year-old Laozhaiyuan; although it doesn’t host opera shows, this humble teahouse will give you a truly authentic tea-drinking experience you won’t forget. Why not make use of a rainy day to stock up on souvenirs to take home to your friends and family? Beijing has some of China’s biggest and best markets, many of which are either indoors or covered. Panjiayuan is one the country’s most famous antique markets, although many of the wares found here are replicas rather than real antiques. That said, this outdoor (but mostly covered) market is enormous and full of souvenir-ready trinkets, from ceramics, statues, furniture, paintings, jewelry, and much more. Beijing’s Hongqiao Market was historically a pearl market and is still the city’s best destination for pearl shoppers, but today this five-story mega-market’s offerings have expanded to include everything from silk and jade, to electronics and knock-off clothing brands. This is a great option if you happen to get rained out of the Temple of Heaven, as it’s just across the street. If you’re looking for some more modern and/or high-end shopping options, Beijing’s Sanlitun area is your best bet. Here, you can find all the best-known luxury brands, the city’s flagship Apple store, the largest Nike store in the world, and more, as well as numerous trendy bars and restaurants. The China Guide is a Beijing-based travel agency that customizes private tours, educational student tours, and incentive trips across China. We have more than ten years of experience creating tours for all kinds of travelers from the United States, Germany, France, Spain, the United Kingdom, Canada, Australia, and beyond. We promise all our tours have no hidden fees, no factory stops, no touristy restaurants, just memorable experiences! Learn more about us or contact us to start planning your perfect China trip. ¡The China Guide se ha clasificado para el Salón de la Fama de Certificados de Excelencia de TripAdvisor! ¡Estamos en el Salón de la Fama de TripAdvisor!